Delcam to demonstrate PartMaker’s novel solutions for B-axis equipped Turn-Mill Centers and Swiss-type lathes at the West Coast’s premier manufacturing event. Figure 1: PartMaker Version 2015 will be on display at Westec 2015. Released late last year, PartMaker Version 2015 features unrivaled technology for automating the programming of multi-axis machines equipped with articulating B-axis heads for machining milled features at arbitrary angles. Fort Washington, PA – PartMaker Inc., a division of Delcam, will demonstrate the latest version of PartMaker Software for programming CNC Mills, Lathes, WireEDMs, Turn-Mill Centers and Swiss-type lathes at Westec 2015 in Los Angeles, CA, September 15 – 17, 2015. Highlighting the new version are a variety of improvements in the software to support today’s latest breed of B-axis equipped Turn-Mill Centers and Swiss-type lathes. B-Axis refers to the ability of a multi-axis lathe to perform milling on at any angle, not just in a vertical or horizontal position. Other highlights of PartMaker Version 2015 include the ability to generate a Post Processor Reference Guide, an on command manual explaining how to program a given multi-axis lathe and take advantage of all the machine’s capabilities with PartMaker as well as more powerful milling and turning functionality and improvements in the software’s knowledge based technology for storing optimal feeds and speeds for additional tools. PartMaker 2015 also includes specialist support for a new breed of machine tools that has been growing steadily in popularity in recent years called Vertical Mill-Turns (VMT). These machine tools are unique because they provide the turning functionality typically found on a VTL (Vertical Turret Lathe) with that of a 5-axis VMC (Vertical Machining Center). PartMaker Inc. is a subsidiary of Delcam, the world’s leading developer and supplier of complete CAD/CAM software solutions. 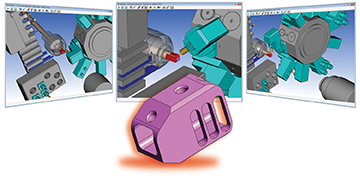 Delcam is a wholly-owned, independently-operated subsidiary of Autodesk. Autodesk helps people imagine, design and create a better world. Everyone – from design professionals, engineers and architects to digital artists, students and hobbyists — can use Autodesk software to unlock their creativity and solve important challenges. In North America PartMaker is sold directly by PartMaker Inc. PartMaker is sold overseas through a network of sales partner offices operating in over 120 countries.